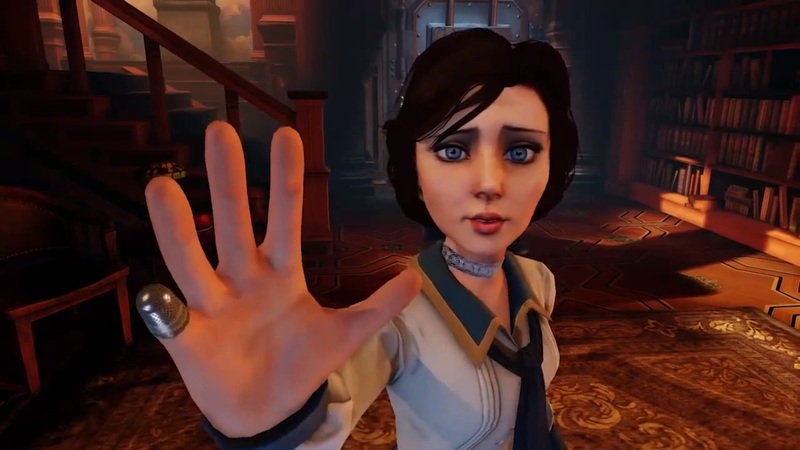 So I’ve been singing the praises of Bioshock Infinite for several months now, and now its time to go back and analyze the narrative missteps it took and figure out why the ending threw so many people for a loop. I’m glad I didn’t write this article immediately after the game came out, because I was blinded to its many flaws because of the awesome relationship with Elizabeth and how the main theme resonated with me. 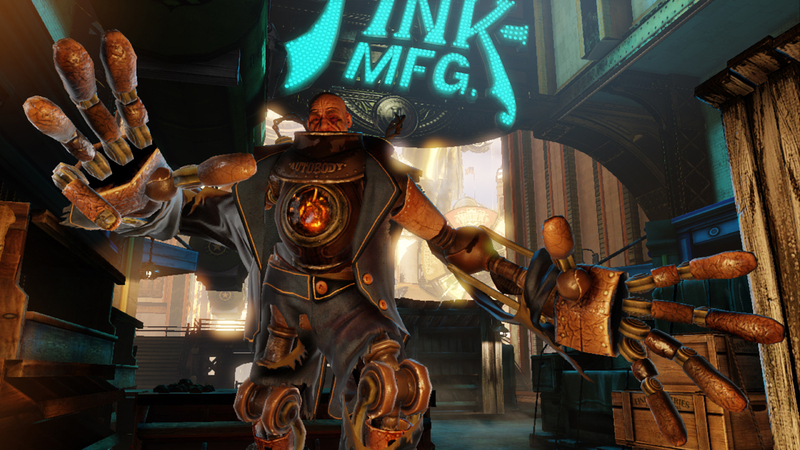 Songbird is Elizabeth’s massive mechanical bird-guardian and relentlessly pursues Booker throughout the game. While the majority of the enemies you face in the game are pretty standard-fare for an FPS, Songbird provided a genuinely fascinating threat. Songbird’s relationship with Elizabeth is of particular interest, because even though Songbird is effectively her jailer, Songbird was also her first (and perhaps only) friend. Elizabeth even tells you that when she was little she was actually excited when Songbird came around, and what little kid wouldn’t be? I know I would have loved to have had a giant mechanical deathbird for a friend when I was growing up. By all accounts Songbird should have played an integral role in the game’s storyline and conclusion, in fact every Songbird appearance could have been accompanied by a giant banner saying “FUTURE BOSS FIGHT!” for all the subtlety it had. So what happens with Songbird? Well…nothing really. Instead of a climactic fight with Songbird, you end up being able to use him to destroy Zeppelins and mow down waves of soldiers like he’s nothing more than an automaton. And I could accept Songbird as a mere machine if not for the fact that the bird obviously displays self-awareness and has its own unique personality. Towards the end when Songbird finally manages to corner Booker and Elizabeth, there’s a moment where Booker comes uncomfortably close to the business-end of a giant steel talon. If Songbird were a mere machine, then there’s no reason to leave Booker alive and he should have been reduced to a very messy stain on Songbird’s polished bronze plating. Yet when Elizabeth’s intervenes and begs him to spare Booker, Songbird stops in its tracks and looks at her. The eye turns from its hostile orange to a calming blue, and for a moment it seems unsure of what to do, but then calmly picks Elizabeth up and flies away. There are only two explanations for this behavior: either Songbird didn’t want to traumatize Elizabeth by smearing Booker across the floor or he was concerned about Elizabeth would think of him if he did kill Booker (IE she would hate him more than she already does.) Neither of those are behaviors I’d associate with a mindless machine. Even stranger, Songbird doesn’t appear to be overtly aggressive. Aside from ripping apart Elizabeth’s statue at the start of the game, which I admit was pretty damn aggressive, Songbird doesn’t seem to engage unless directly provoked. Remember when the Vox Populi were tearing the military of Columbia apart? Why wasn’t Songbird there beating them back? A giant invulnerable steel eagle would be damn handy in a fight. More handy than these so-called Handymen. Songbird never lifts a finger talon to help Comstock or his armies suppress the Vox Populi revolt, and despite what the propaganda posters scattered around Columbia say, Songbird doesn’t seem to give a damn what happens to the city itself. 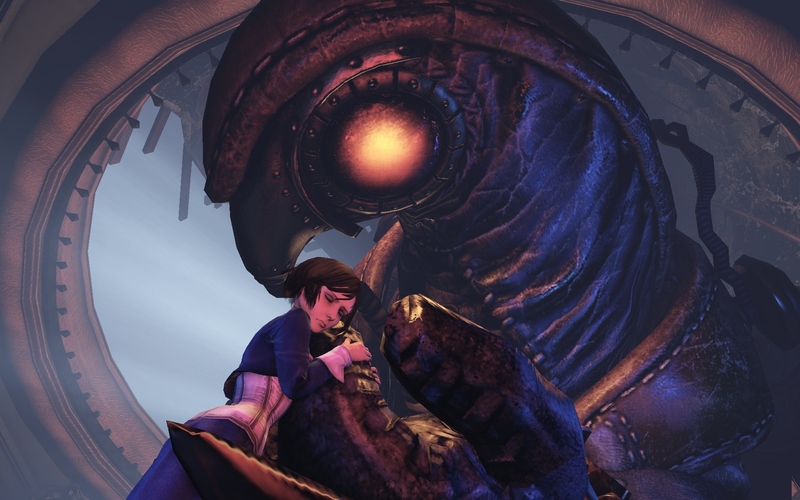 Songbird’s only concern is Elizabeth, and its actions throughout the game are more in-line with a frantic parent than an unstoppable warmachine. In fact I half-expected Songbird to come to the rescue when she was being brutally tortured by Comstock and his goons, because its genuine concern for her safety seemed at odds with Comstock’s plans for her. And when that didn’t happen, I thought perhaps the Dove/Cage emblem that future Elizabeth writes on the note was referring to Songbird. Unfortunately none of that came to pass. It’s a shame that Songbird is relegated to a support role and given a rather ignominious death at the end of the game, because Songbird was one of the most fascinating things in the game. We could have had a really great moment when Elizabeth and Booker are forced to kill Songbird, with Elizabeth finally having to say goodbye to her childhood friend and the past it represents which would be in line thematically with rest of the game. Alternatively we could have had Songbird come to the rescue just when all seemed lost, and it wouldn’t be a figurative Deus Ex Machina (though it would be a literal one), because all the events throughout the game would have reinforced the idea of Songbird as a savior rather than a killer. Instead one of the most interesting elements of the game is reduced to a cheesy gameplay mechanic and then swept under the rug. You’re presented with several choices throughout the game, but they all result in the same thing: nothing. None of the choices you make in the game have any effect whatsoever on the storyline or characters. The most obvious example are the pendants the Lutece siblings present to you, no matter which one you take, the story unfolds exactly as it did before. Later the Future Elizabeth gives you a scrap of paper to give to her former self, which will depict the opposite of whichever pendant you chose (if you picked Dove, it’ll show you a cage) but again it has no bearing on the story. Elizabeth even speculates on what significance the paper has, but then promptly forgets the matter after ascending into a Timelord. The only clue that there might be some story element behind this choice is the fact that, at the end, the Elizabeth you’re speaking to isn’t wearing the pendant you gave her and I’ll speculate on this when I talk about the ending. There are plenty of other choices throughout the game as well that ultimately lead to nothing. Do you throw the baseball at the interracial couple or Fink? Do you spare Slate or kill him? Do you hold up the usher or try to play it cool and buy a ticket? The only choice that had any kind of impact on the story was the Usher choice, and I liked the fact that Booker has to walk around with a bandaged hand if you choose to keep your gun holstered when trying to buy a ticket. You’re also treated to a rather tender scene of Elizabeth tending to your new stab-hole. And what’s up with this game and hand injuries, anyway? However, aside from those mostly aesthetic differences, none of your choices amount to anything. You get different gear depending on whether you threw the ball at Fink or not, and you get to see Slate reduced to a drooling vegetable if you spare him, but none of that impacts the story and it doesn’t seem like it would have taken a lot of extra work to show the impact of those choices. I’m not asking for alternate endings, just some feedback on the choices I’ve made. For instance, shortly after your escape from the carnival you enter an Abolitionist’s house. Now originally I thought they agreed to hide me because I’d chosen not to throw the baseball at the interracial couple, but on a second play through where I did throw it at them, they’re just as helpful. It seems like it wouldn’t have been all that difficult to make them a bit more hostile if you’d chosen the more hateful option. With Slate you’d think we could have had an option to save him from the jail, after all we were already there and had killed all the guards, or at least mercy kill him there. 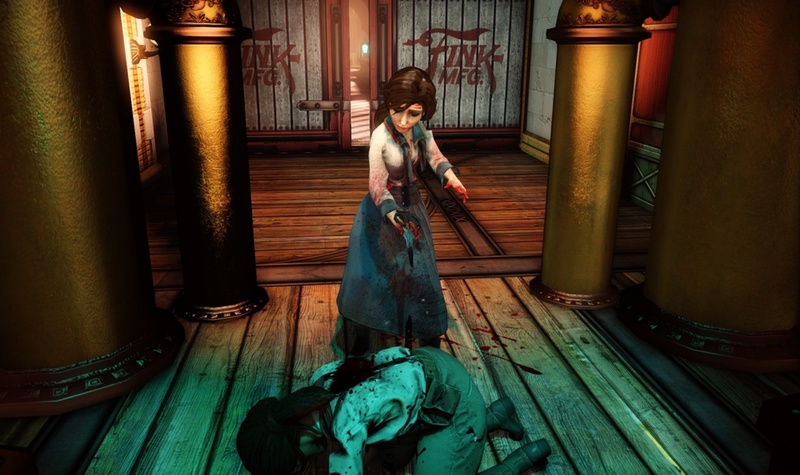 I did end up putting a bullet through his head because I felt sorry for him, but Elizabeth just stood there as if nothing had happened and that’s just sad. Finally, it would have been nice to see some residual effects from taking a knife through the hand, even it was just an occasional flinch whenever he had to grab something with his injured hand. Again, I’m not asking for anything huge, but if you’re going to put choices in a game you need to provide some feedback. In Infinite we got no feedback from our choices, and that ultimately made them unnecessary and unsatisfactory. Again I want to state that I do like this ending. I like that it’s ambiguous and open to interpretation from so many different angles, and I loved that they took the complexities of a time-travel plot to their furthest extreme. That said I understand why some of you hated the ending, I really do, and I want to address the main flaw in this ending. I think the biggest problem people have had with the ending besides its almost infuriating amount of ambiguity, is the fact that we lose Elizabeth without ever getting a chance to say goodbye. As I’ve harped and ranted on across multiple posts, we care about the characters in our stories and not so much the story itself. The Elizabeth we talk to in the river may walk like her, and talk like her, but she isn’t our Elizabeth. She’s not the Elizabeth we’ve grown to know and love throughout the amazing journey we’ve taken. 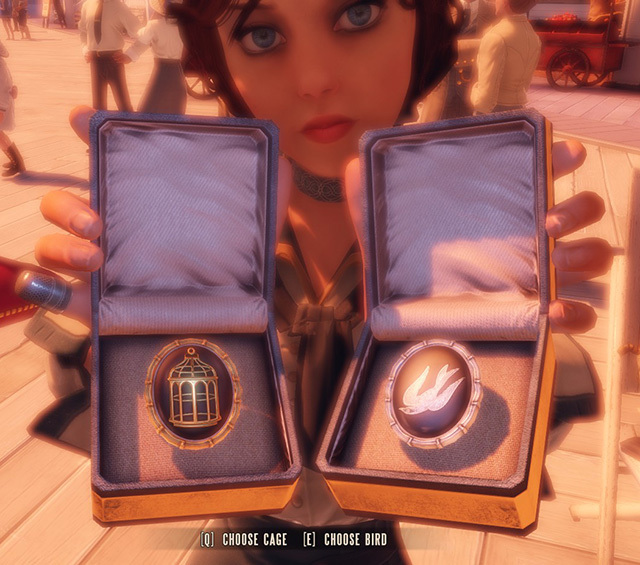 What made Bioshock Infinite such a great game was the slow revealing of Elizabeth’s character over the course of the game, and how her character evolved as the story progressed. She starts off as a naive, romantic girl whose only desire is to go to Paris. However she’s also extremely afraid, her begging Booker to kill her if she’s recaptured was evidence enough of that. By the end though, the events of the game and weeks of torture have forged her fear into hate and her naivety into fury, evidenced by the torturers she tore apart with her mind. Yet even at her most vindictive and lost, there’s still evidence of her sweet personality and inherent kindness. Even the future Elizabeth, a mere husk of a woman after enduring years of torture and brainwashing, is in the end a caring person and not even Comstock’s cruelty could entirely destroy her empathy and compassion. Unfortunately as soon as the Siphon is destroyed, that girl we grew to love and care about dies. In her place we get an even more ambiguous version of the Lutece siblings, and while I appreciate the fact that Elizabeth’s powers are now complete and that would give her a unique insight into the workings of the universe, I can’t believe her personality becomes so submerged so quickly. It’s a shame really, because I think the ending would have been much more powerful and emotionally satisfying if it were our Elizabeth holding us under the water. If we’d been allowed a tearful goodbye I think the final moments of the game might have left a powerful feeling of bittersweet resolution in the hearts of players, rather than a befuddled mess of quantum mechanics in their brains. And didn’t anyone think it odd that Elizabeth freaked out over killing a clearly insane Daisy Fitzroy, but was totally cool holding you under the water? She doesn’t even shed a tear. Now regarding the pendant switch, there is a potentially interesting twist here because if she’s not the girl we’ve come to know and love then just who the hell is she? What are her motives for pulling us out of our universe? How did she do it, and why the deception? And most importantly, what did she do with our Elizabeth? I don’t have answers to any of these questions, and if there are answers, then I predict we’ll have to wait for Bioshock Infinite 2 or a DLC to find them. Nice read! I wonder, did Booker tell Elizabeth that he got the paper from her future self? 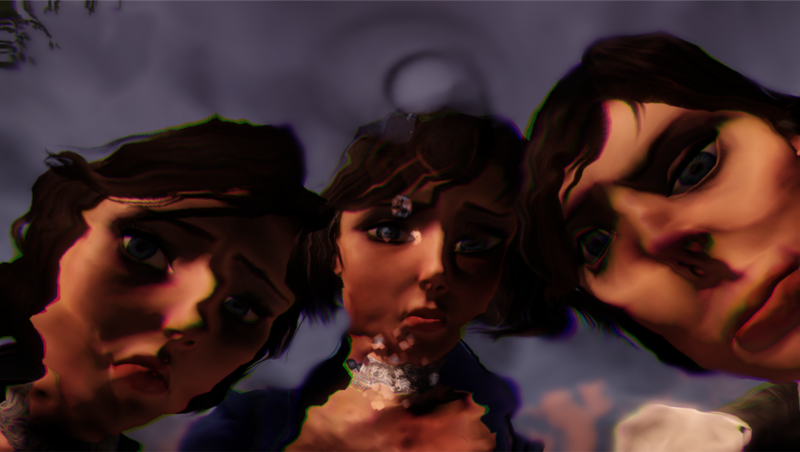 Just in case theres any hint that Elizabeth might have gotten conscious of the multiple-reality thing before the siphon was destroyed, id say the paper was the “missing piece in the puzzle” for elizabeth to understand what caused all this mess. When i saw the cage on the paper, i had already forgotten the two amulets from the first stages of the game. However, now that you made me aware of it, id say Elizabeth interpreted it the way the siblings interpret pretty much any event in the game: “Two sides of the same coin”. The bird and the cage are two entirely different symbols, the one representing imprisonment while the other represents freedom without limits. No matter which one we gave elizabeth, she was always able to interprete the message as a hint to the ambiguity of bookers person. In fact, id say it was this event that initiated the plot-twist, because it changed elizabeths perception of the two characters comstock-booker. Becoming a drunken thug or an evil dictator are two things that are almost as different from each other as the cage and the bird. And the amulet was related to bookers former decisions, showed how different even the BOOKER-SELF could percept the world and therefore make different decisions. If we are talking about one very specific moment in one very specific reality, a being who has complete inisght into someones personality could easily predict the decision of a person who has to chose a cage or a bird symbol as an amulet for another person. Id say that a person would only be able to chose on of them, if hes following only his own judgement and is not influenced by external factors. Because then such a choice really becomes a matter of your very own self and how you view the world and persons around you. It still doesnt justify the hollow elizabeth we get in the end, but it explains the function of the scrape paper. The information elizabeth got was the seed for her perception of the multiple realities when she became a timelord. That way, the transformation of her personality becomes plausible, because it unfolded from a disturbing moment that changed her understanding of the events that took place and therefore calls for new “countermeasures”. However plausible it might be though, its still very unlikely that she transformed to such an unperson, who lacks any human trait. The way it was done, what happens is really like some kind of apotheosis, something that happened to figures in ancient mythologies quite often. But we do not have a greek drama here, so it feels unfitting and besides that, an apotheosis doesnt serve any point from a narratological point of view, because it simply cuts off the bindings between the reader and the figure due to the dehumanization taking place in this process. Lots of great info here, and I like how you think. Using the scrap of paper as kind of a clue to the workings of multiple universes is interesting. I also like the idea that the different amulets were pointless for us, but gave Elizabeth insight into Booker, that’s a nice touch! Well done!